Just in Time for Gift Giving, or Winter Sipping! Want to finish your holiday shopping early? We have now released a limited supply of our small barrel, select whiskeys. These will only be available in the tasting room, and only in 200mL bottles. They will be sold individually, or as a 3-bottle boxed set. Sherry Cask, Stout Cask and Rye and Rested are included in the branded wood collector’s box for $75. Since these are only at the distillery, you have (yet) another reason to come on down and see us. After a year in new oak, this whiskey is then finished in a port barrel from Stone Hill Winery in Hermann MO. 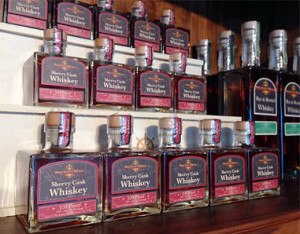 American whiskey made from corn, finished in a traditional Scottish style. After a year in new oak, this whiskey is then finished in an Oloroso sherry cask. American whiskey made from corn, finished in a traditional Scottish style. Second Shift Brewery in New Haven, MO finishes some of their acclaimed stout in our whiskey barrels. We return the favor by using the barrels to finishing our year old whiskey. After a year in new oak, this whiskey is then finished in a French oak Zinfandel barrel from Peter Franus, Brandlin Vineyard on Mount Veeder, Napa Valley.